La Gomera is the second smallest of the Canary Islands. It’s almost perfectly round and ruggedly beautiful, tumbling from cloud, shrouded rain forest, down steep volcanic slopes into deep ravines and verdant valleys. Where there is water, plants grow abundantly and everywhere you look there are breath-taking views. Until relatively recently the only way to get around this challenging terrain was on foot – roads and vehicle tracks appearing a mere 30 years ago. Trails, that were used by Gomerans going about their daily lives since before the Spanish Conquest in the early 15th century still criss-cross the island leaving a ready made network of paths for today’s hikers to enjoy. Andy and Paddy arrived in a sailing boat over 10 years ago, stepped ashore, and fell under the spell of this unspoilt island. It reminds them, Andy says, of county Donegal in Ireland where they hail from – but with a lot more sunshine. 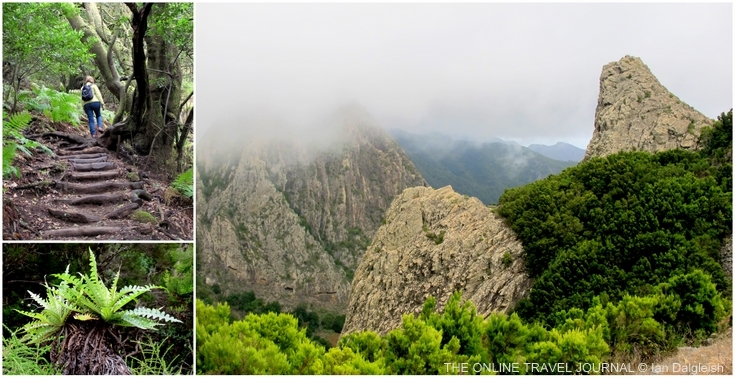 In 2010, having set up home for 8 months of the year in Playa de Santiago a few years before, they launched Gomera Walking offering week long trips with walks guided by themselves. I asked Andy if they had always been walkers, Paddy yes, he wrote back, adding she’d climbed Kilimanjaro a few years ago. Himself, he’d only started walking seriously when they came to La Gomera, the weather back in Ireland plus suffering from arthritis putting him off before. I can’t remember when I first read about walking on La Gomera but I know when Ian and I came to plan our all too brief trip, packing the walking boots in hope of treading a stony trail or two was a priority. A search online brought up Andy and Paddy’s offering emanating a feeling of organization and suggesting from the friendly style that a hike with them would be an easy-going, companionable experience. As things worked out we missed being on the island at the same time but Andy organized our stay in the apartments in San Sebastian, recommended a number of restaurants nearby and arranged to leave a map and walking guide with Daniela, the receptionist, so that we could get a feel for walking on the island. Well, we too were captivated by this island with its strange rock formations and magical cloud forest. We took a walk in the Garajonay National Park in a fairytale-like world of twisted tree roots, lichen covered branches and primeval-looking ferns and felt as though we’d entered a secret place. Regretfully there wasn’t time to follow other paths that beckoned as they snaked away down the hillsides and we had to content ourselves tracing their routes across the landscape from the map. After this tantalizing taster it has been interesting to hear views of the some of Andy & Paddy’s guests, warming too, as all confirmed what we sensed already; that they give a great time and value for money. Mike pointed out another bonus of the trip across the water. “Andy told us to look out for whales and dolphins,” he said. Five guided walks are included in the 7 night package – one day being put aside for guests to explore on their own. The reality is more akin to a week’s walking with old friends who’ve taken care of everything. Groups are small, usually around 7 or 8 people, and each day’s route choosen to take account of the abilities of the guests and the weather. Paddy and Andy go out of their way to be accommodating – John spoke of how they arranged for his wife Linda, who suffers from angina to join them for half days, which allowed her to keep walking and enjoy the whole week, while for Eileen and Brian they rose to the challenge of finding ‘gluten-free vegetarian’ food. The routine is to meet for coffee then drive to the start of the walk which range between 3 – 5 hours in length. As we discovered most walks are linear and this is where having someone to ferry you and arrange the logistics is a great advantage – we found the buses fine to travel on, but given the routes and limited timetable difficult to fit with one-way walks. Andy outlined a couple of the walks they normally do. One involves a 450 meter climb up to the Casetas Ridge with the reward of stunning views of El Teide on Tenerife to the east, San Sebastian to the south and Roque Agando & Degollada de Perazza across the valley to the west, then follows the ridge before dropping down to wind back to San Sebastian. Perhaps keen walkers might look for longer days, and some of the walks can be extended, but on the whole it seems the mix and pace that’s struck is a good one, well suited to the rhythms of the island. Guests have a choice between Pamper and Popular Packages with different accommodation and we were fortunate in being able to try both, starting with a night in the superbly situated 4 star Hotel Tecina Jardin on the south coast. The hotel occupies the cliff top above the village of Playa Santiago with charming terraces of rooms in Canarian style set amongst beautifully kept gardens. This is the sort of hotel where you can relax with everything to hand, take a dip in the pools, enjoy live music in the bars, some pampering in the spa … or get lost in a good read on your balcony. Breakfast and dinner are buffet style affairs with lots of choice -having pancakes for breakfast was my indulgence. * Staying in the apartments in San Sebastian, offers a different sort of experience. Those signing up to the Popular package, not only walk together during the day but eat together in the evening too – meals and drinks are included in the package. Notably everyone who went for this option mentioned how much they had enjoyed eating at different restaurants, talking of how they all had their own specialities and how it was nice to have guidance when choosing from the menu is often pot luck. Socially this option seems a hit too – many of the guests are couples and Mike travelling on his own said he’d wondered how the dynamics might work but it was fine, very inclusive. The apartment, in a modern block, had a lounge, kitchen area, separate bedroom with twin beds and bathroom; was comfortable and impressively clean. There’s a supermarket around the corner with a small delicatessen counter selling cheeses and meats, fresh bread, fruit & vegetables and all you need for light catering. We were very taken with San Sebastian, it lacks the commercialism of towns like Los Cristianos on Tenerife while having a cosmopolitan air and being able to walk out the door and take a stroll was very pleasant. My happy conclusion is that La Gomera is an island made for walking and Paddy and Andy the perfect hosts. With thanks to: Peter & Tanya McWilliams, John & Linda Goodwin, Mike Quinlan & Eileen Coates for their comments. Popular Package includes: 7 nights accommodation in self catering apartment in Playa de Santiago plus transfer by road & ferry from Tenerife South Airport Cost € 599 per person sharing. Single Occupancy premium €150. *Since I wrote this piece the Popular Package is now based in Playa de Santiago on the south coast of La Gomera. The apartments with south facing terraces are a 5 minute walk from the low key sea front promenade. On a stroll from the Hotel Jardin Tecina up on the cliff we paused at one of the cafe restaurants here for refreshment and very pleasant it was. Meals are not now included in the package but I can vouch the restaurants nearby have a choice of tempting reasonably priced dishes. In addition to these guided walking holidays Andy and Paddy now organize holidays including accommodation, transfers, ferries and hire car for non-walkers or independent walkers, so do get in touch with them if you are thinking of taking a break in sunny La Gomera. Andy and Paddy report that thankfully, after the terrible forest fires of the summer huge areas of the Garajonay National park still “remain pristine and totally unaffected”. Some of their favourite places like the Benchijigua Valley and Alta de Garajonay have suffered but even here there are already signs of new growth. So don’t be put off; from our brief exploration of the island I’d say you’ll be missing out if you don’t go. If you live on La Gomera or have visited recently, do let us know how things are, we would welcome your news.